I do not want to write too much story about this post. However, I have to mention one thing here. If you are used to using store bought coriander powder, switching to a home-made coriander powder can be a turning point in your whole cooking experience. It was the case with me. I used to make everything using store bought coriander powder. Once I made my mom’s bhindi/okra fry and it was nowhere close to what she prepares, though I had taken time to fry it well like she does. Then I asked her what could have possibly gone wrong and she brought to my notice that it could be the difference due to the coriander powder. Immediately, I got the coriander powder recipe from her and the secret ingredient is the ‘fenugreek seeds’. It was a whole new revelation to me that something that small can make such drastic difference. Ever since, I have always got bhindi/okra fry just perfect. 1. Heat a pan and dry roast coriander seeds, dry red chillies and fenugreeks seeds together. Keep saute’ing. 2. You would know that the coriander seeds are getting roasted when you hear the popping sound. Fry in medium-high flame till the popping sound almost stops and you start getting a nice aroma of coriander seeds(Another way to identify when to stop dry roasting would be when you see the color of the coriander seeds going brown, not dark brown 🙂 ). 3. Grind into fine powder in a dry grinder/mixie. Notes: The dry red chilli gives a good color to the coriander powder and the fenugreek seeds adds aroma to the spice mix. Puli in my native language means Tamarind or sour. In this context, it means tamarind. Inji means Ginger. So now you know what Puli Inji could possibly mean. It gets a perfect blend of sweetness from jaggery, sourness from tamarind and its fair amount of hot and spicy touch from Ginger. This is another placeholder in the ‘Sadya Ila’ (Feasts in Kerala are served in banana leaf and Ila means leaf) along side other pickles during Onam. Though it is served in a very minimal quantity(less than a tsp), an onam sadya is incomplete without puli inji. You will find various versions of this item going from south to north Kerala. Towards the south, it is called Inji Puli or Inji curry. There might be slight variation in taste too. The difference could be in the proportion of ginger and tamarind used or in the consistency of the item. Well I know that I have got my perfect proportion for Puli Inji and that is given below 😛 My friend suggested me to mention that it has a good shelf life. You can store it in the refrigerator and it will stay fresh for 3-4 weeks. 1. Heat coconut oil in a pan. Add mustard seeds to it. Once it splutters, add grated ginger and chopped green chillies. Also add the curry leaves. 2. Fry ginger till it looses its moisture and becomes light brown. 3. 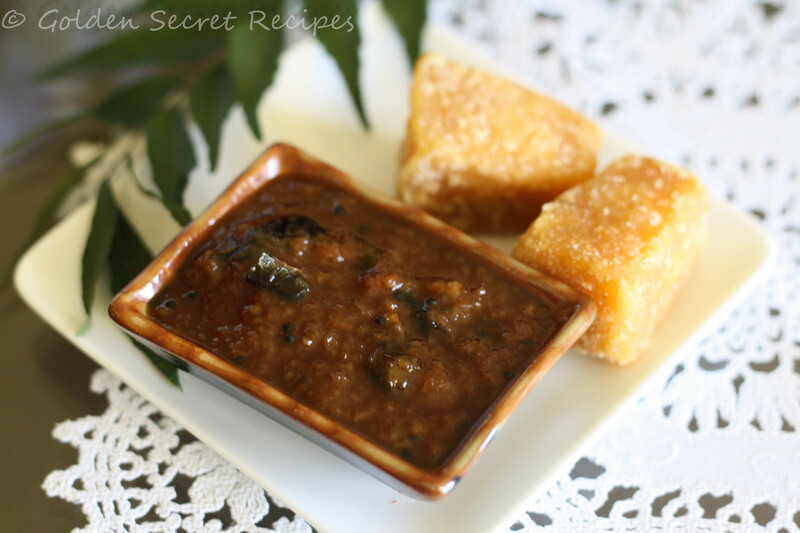 Now add the tamarind paste and jaggery. 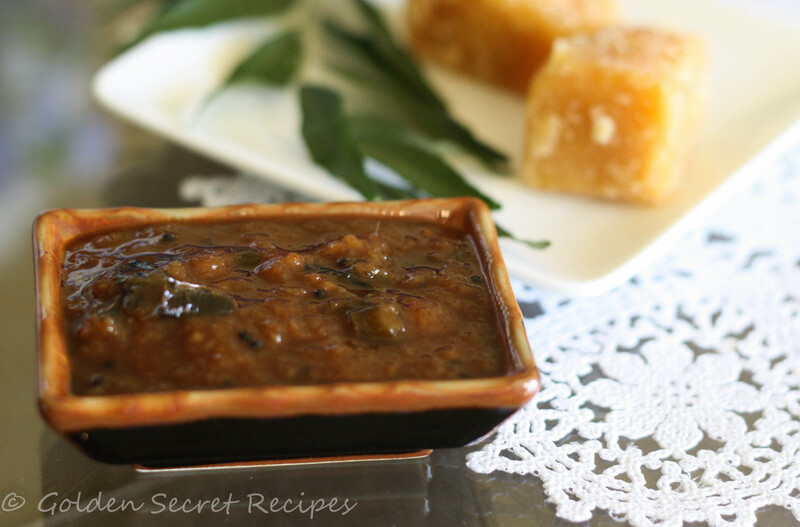 Pour ½ cup water and melt the jaggery. Saute occasionally. Add more water if required. 4. Once jaggery melts, add red chilli powder, asafetida and salt. 5. Continue to cook in medium heat till it reaches the right consistency. It should be a thick paste and not watery. Note: If you are not using tamarind concentrate, you would have to soak 2 gooseberry sized tamarind balls in 1 cup warm water. Squeeze the tamarind well and use this tamarind water. In this case, you will not have to add extra water to melt jaggery. Also, you will have to cook it longer to get it to the right consistency. One such case is the garam masala. 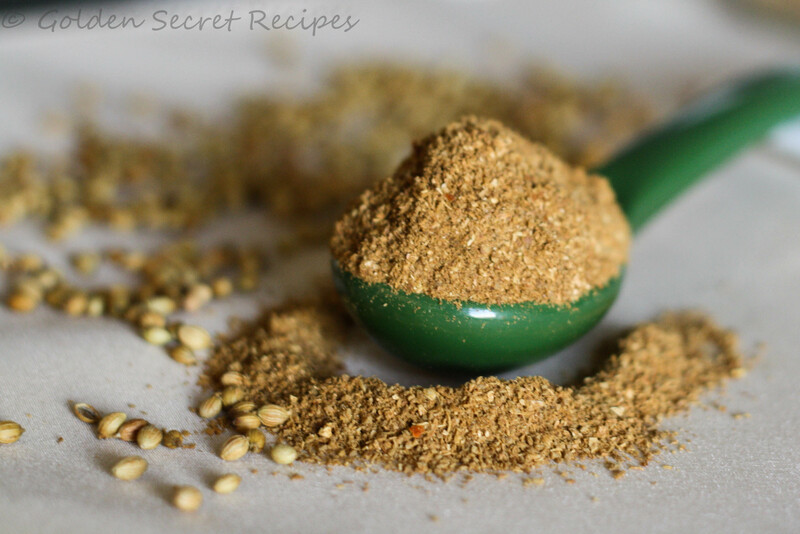 My mom used to make her own garam masala for her cooking. And I knew the taste and aroma of it. I tried many brands but didn’t find anything close to what she would make. But voila! at last I found one brand which had the same exact aroma and taste of what my mom used to make. Now that brand became my default brand for almost all spice mixes and specifically garam masala. But this time when I went to get this from the store, I didn’t find it in the store. I thought may be the store doesn’t have the stock and it will be available next time I go or I could easily find it in other grocery stores. After all, there is no shortage of Indian grocery stores in the Bay Area! But alas! my hopes were shattered, when I found out after a search of about 3 months in almost all the Indian grocery store that they no longer make this product. I was so disappointed. I tried my luck with couple of more brands but those also turned out to be major disappointments. Then one day I thought why not try making it myself. After all, I have all the required whole garam masala with me. So I tried and guess what, I am NOT going back to any stores anymore looking for a good brand of garam masala. 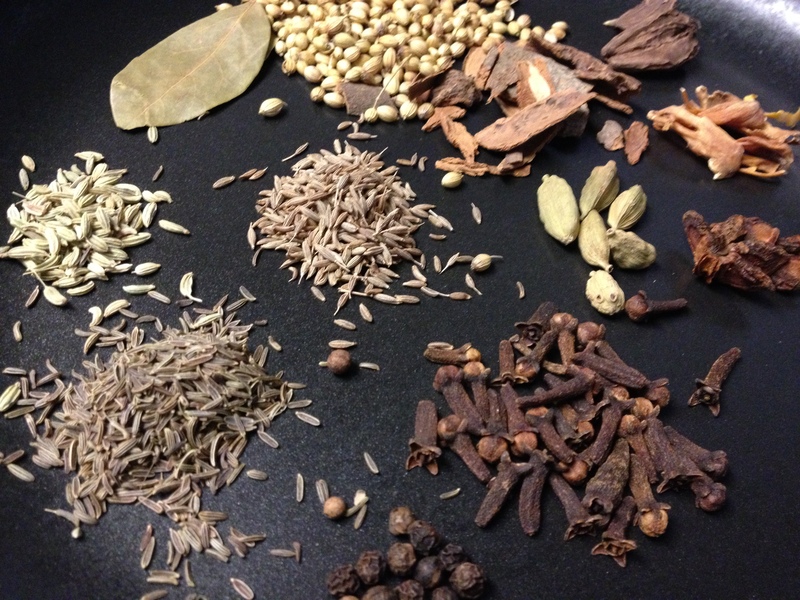 If you are doing what I used to do, trust me, try making the spice mixes at home. It doesn’t take much effort or time. But what you would get after 5 mins of your effort is simple amazing. You would never get the same aroma from any store bought spice mixes. 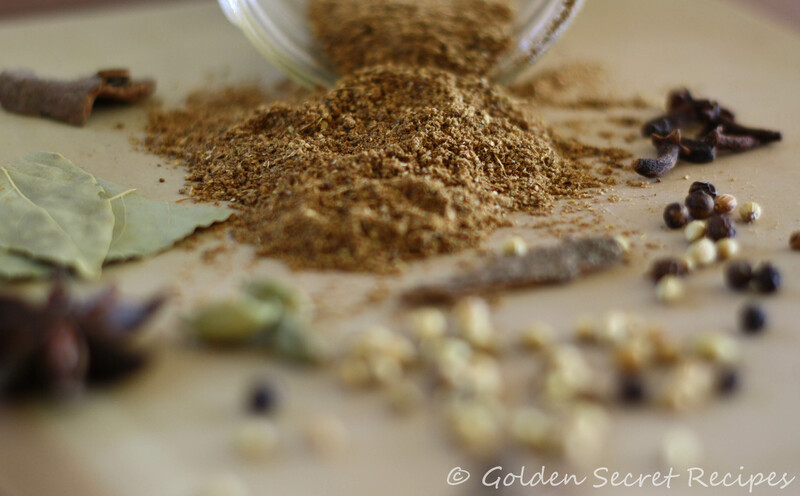 And garam masala is one of the easiest to begin your experiments with making spice mixes. 1. Heat a pan and put all the ingredients in it. Dry fry these spices in medium flame. 2. They will crackle while frying. Once the crackling sound stops or the spices turn light brown, switch off the stove. 3. Let the spices cool down. 4. Grind these to a fine powder.